In each country you can discover a multitude of culinary experiences that will enhance your taste buds and give you a new experience. This is also true for fruits. There are specific fruits that you can find in different parts of the world, and some countries are famous for the exotic sweet natural fruits. Singapore is no exception and here you can buy different fruits for each season to give you a perfect mix of nutrition and amazing taste. As a Singaporean, you’d know how long do certain seasonal fruits last in your country and what fruit is best each month. However, if you don’t have much information about that, here we have best fruits seasons in Singapore and a look at what specialties does each season bring. In the winter season, there is a variety of fruits you can find in Singapore to enhance your culinary experience, include in your dishes or eat raw and enjoy the tasting experience. Here are the best Winter fruits for Singaporeans. One of these fruits is avocado; this fruit is famous around the world now for its incredible natural properties and included in almost all special diets that are known to help with weight loss. Even though few people know this, avocados are also grown in Singapore. Most of avocados come from countries like Mexico or Australia, but it’s always best to buy local. Avocados are good for your health as they contain fiber and oleic acid. Singaporeans can buy them at their best from December through August. Papaya is another fruit you can find in winter in Singapore and they are absolutely delicious! Usually, classified as a winter fruit, Papayas are available in Singapore year round. Papayas are used for multiple purposes in the kitchen, from milkshakes to cookies or raw eating. Papayas are very good for the digestive system, so do not forget to include them into your daily diet! In the cold winter you can keep your vitamin intake good with fruits like grapefruits, lemons, oranges, pineapples, bananas and apples. Winter is a harsh season on our bodies, but these fruits can help us keep up a healthy lifestyle and enjoy the sweet taste of these natural foods. Spring is a beautiful time in Singapore both when it comes to the weather and for fruits as well. You will find this season to be packed with delicious fruits you can include in your diet. Let’s look at some top fruits for the season. Strawberries tops the list of Spring fruits in Singapore and can be found from March all the way to late summer and you will absolutely love them. Strawberries are the most famous berries in the world. In Singapore, you will love the fresh taste and flavor of strawberries that are all natural by the way. Another fruit to be found in spring in Singapore is the mangosteen. 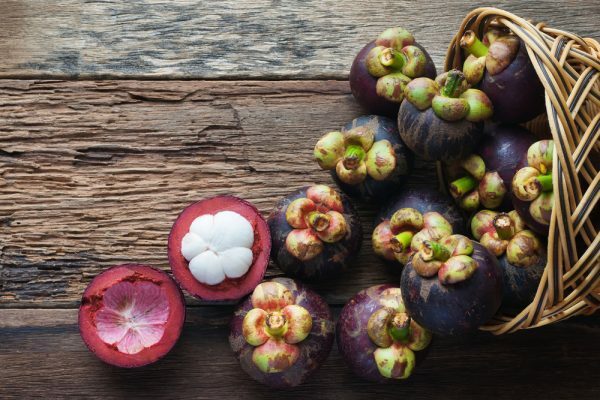 A local specialty, mangosteen is available in Singapore from April to July and you will definitely love it. This exotic fruit has been called the queen of fruits and it looks like garlic on the inside. However, do not be fooled by this resemblance, the fruit is very sweet and tasty when it is ripe. Jackfruit makes another great fruit to have in Singapore in Spring. This exotic food is used in desserts and also eaten raw. Jackfruit is also very healthy and can help with blood pressure and represents a good source of magnesium and potassium as well. You can have it from April through September. In the spring you can also consume lychee, a fruit that is more and more popular worldwide. Available only in the late spring, this exotic fruit is delicious and must be tried by every Singaporean when the season arrives. The fruit is usually best to consume in May and June. In spring, let’s not forget about the delicious pineapples that are actually famous all over the world for their unique taste. In this season, you can also find apricots, bananas and apples. The beautiful summer is the time when the nature lives to the fullest and it’s also when you will find most of the exotic Singaporean fruits on the market. Here are some best Summer fruits. One popular summer fruit in Singapore is the longan, which is also known as “the dragon eye”. This fruit is so sweet that it is used as a natural sweetener for soups or desserts. It is available from June through September. In summer, you should also try the famous and delicious mango. Who doesn’t love mangoes? You can use them raw or in your favorite desserts. You can have this delicious treat from June through April. Another fruit that is only available in the summer in Singapore is Rambutan, an exotic fruit that very few people know about. You can enjoy it from June through August. This fruit is best enjoyed chilled and can be a great summer dessert. In the same summer months, you can also find fresh Durian as well. This fruit is not as popular worldwide as other exotic fruits, but it is very tasty and you should definitely give it a try in Singapore. This creamy and yellow fruit is one of the favorite summer foods of Singaporeans. And last, but not least, go for blueberries in the summer months; they are incredibly good for your health, very tasty and have gained a tremendous popularity worldwide. Use them raw or in your breakfast for a low calorie, vitamin packed fruit. Blueberries are used in diets that promote weight loss all over the world and are best consumed from June through August. The summer is also the seasons of blackberries, muskmelons, cherries, honeydew melon, kiwifruit, nectarines, peaches, plums, raspberries and watermelons. Taste the summer completely as it is filled with delicious fruits you cannot get enough of! In the autumn season you still have many fruits available from other seasons, such as avocado, papaya or mango. But, here’s what is linked this season specifically. The most famous fruit in the fall season in Singapore is the dragon fruit, also known as pitaya. This is a tropical super food which is very popular in Southeast Asia. Dragon Fruit is very distinct – being pink on the outside and having a white flesh and black seeds inside. The Dragon Fruit can be very sweet, but you can find assortments with less taste too. The only warning is to not eat the fruit’s skin; it can be dangerous to your health. The autumn season is also the season of grapes, cranberries, pears and raspberries. Autumn is great to pack up with vitamins for the winter coming up, protecting your body from colds. These fruits give you plenty vitamins and fibers to keep you safe from unwanted health problems. So, which fruit you’d like to savor on? There is something special for every season and everybody can satisfy their taste buds. Hopefully, you have enough information now to pick and choose some healthy fruits for yourself.